Well, we’ve made it back to shore and the cruise is finished. We’ve unloaded our gear and the RRS Discovery is already on the next expedition headed towards Iceland. As the Principal Scientist on the cruise, I’m ecstatic about the results we achieved. There is a great team of scientists, technicians and ship's crew to thank for making the fantastic data collection possible. We not only collected a great selection of seafloor samples, but collected more than 300km of seafloor photographs - more than 186 miles. Image showing 18 x 1 m segment of photographic data with the long-tailed sea cucumber psychropotes longicauda visible. Scroll to view more of the seabed. 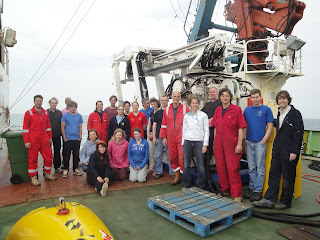 This data will allow for a study of unprecedented scope in terms of scale and detail for abyssal depths. It will take us more than a year to process all our samples and analyse all the pictures, but the result should provide new perspectives on biodiversity and the implications of future climate change for abyssal plain habitats. In the weeks and months to come this website will continue to document project progress. We will have lots more to share before too long!